Aishwarya Dutta, Vijayalakshmi, Riythvika and Janani Iyer entered the last stage of Bigg Boss Tamil 2. Here, we bring you live updates of the grand finale. The episode was kick-started with friends of the finalists entering the house and presenting gifts to them. The surprising part of the day was that Telugu actor Vijay Deverakonda entered the house to promote his upcoming movie NOTA. He interacted with the inmates and let each finalists touch the winners' trophy, while asking them to say a few words about having the prize in their hands. Later, he met Kamal Haasan and had a small conversation. 11.19 pm: The host feels that her elimination is unfair. 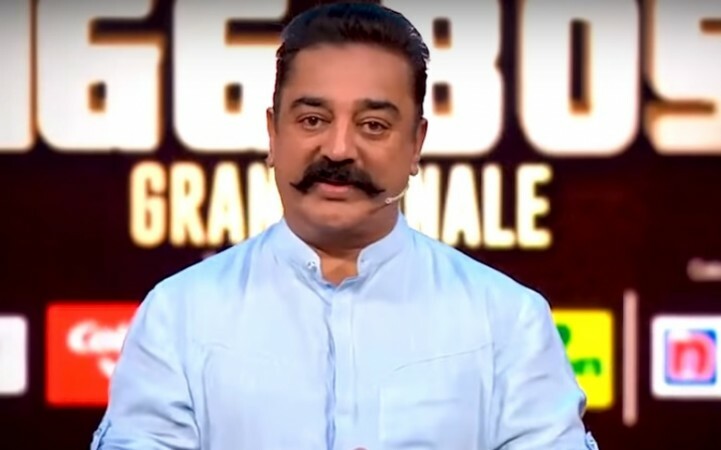 11.12 pm: Kamal Haasan says that this attidue might not have helped her win the Bigg Boss trophy, but it will help her win many more in real life. 11.08 pm: Janani Iyer is on stage. Kamal Haasan hails diplomatic way of handling issues in the house. He says that every individual has his own way of playing his games and she had done well. 11.00 pm: In a shocking development, Janani Iyer is eliminated from the show. 10.50 pm: Groups dancers come to the house and dance for popular Tamil songs. The finalists join them. 10.45 pm: Time for the elimination. One among the four will be out of the show. 10.38 pm: Kamal Haasan asks the eliminated participants what would they do if they were made the same offer. 10.35 pm: Aishwarya drops her plans as Bigg Boss tells that Rs 10 lakh will be given from the prize amount presented to the winner. 10.30 pm: Kamal Haasan tells that there is an offer to the finalists. A briefcase containing Rs 10 lakh briefcase is shown to the inmates. Aishwarya expresses her wish to walk out of the house with the money if it is not given from the Rs 50 prize. 10.22 pm: Kamal Haasan weclomed Vijay Deverakonda to Kollywood and said that the Telugu film industry welcomed him with open arms years ago. He hopes the young talent gets the same reception from Tamil cine-goers. 10.18 pm: Vijay Deverakonda tells Kamal Haasan that it was for the first time that he was meeting him. The young actor tells that the legend is a reference point for any kind of role. 10.15 pm: Vijay expresses his desire to meet Kamal Haasan person and says that there was high security, so could not meet him. "It is lovely to be. Thanks for having me here," Vijay tells Kamal Haasan. 10.11 pm: The four finalists and Vijay Deverakond pose for a photograph. He plays the trailer of his NOTA. 10.10 pm: Vijay Deverakonda hands over the trophy to each contestant and asks them to share a few words about having the trophy in their hands. 10.08 pm: The inmates are familiar with his face. He talks to them. Vijay tells about the release of his movie NOTA. 10.05 pm: Telugu actor Vijay Deverakonda enters the Bigg Boss Tamil house. 10.00 pm: Kamal Haasan unveils the Bigg Boss Tamil 2 trophy. 9.48 pm: Kamal Haasan talks to the inmates. Talks to the finalists and conducts a small quiz. He has some serious and interesting questions for which the inmates answer confidently. 9.46 pm: 45 minutes into the show and 16 minutes already gone for commercials. 9.34 pm: The guests leave the house and the finalists spend their last night at the Bigg Boss Tamil 2. 9.31 pm: Actors Kreshna and Sunaina meet their friend Vijayalakshmi and other finalists after Ashok left the house. 9.25 pm: Now, Janani's friend Ashok pays a visit to the house. He presents a gift and in return gets a piece of cake. 9.11 pm: Riythvika's friend and actor Kalaiyarasan comes to the house. He is out of the show. Time for the first break. 9.10 pm: She presents a gift to Aishwarya filled with chocolates. And Bigg Boss asks Swaroopa to leave the house. 9.06 pm: Aishwarya's friend Swaroopa enters the house. She introduces her to other finalists. 9.03 pm: Kamal Haasan takes the stage. All the evicted participants except for Ponnambalam are present. 9.02 pm: The show begins with a line dedicated to all the eliminated contestants of Bigg Boss Tamil 2. 8.46 pm: Has Aishwarya Dutta walked out of the show with Rs 10 lakh? The latest promo indicates it. 8.31 pm: The latest promo shows Bigg Boss offering Rs 10 lakh to the contestants. Any inmates, who want to leave the show with the amount, can walk out of the show. The show kick-started with 16 contestants and in the end, only four members -- Aishwarya Dutta, Vijayalakshmi, Riythvika and Janani Iyer -- have entered the last stage of Bigg Boss Tamil 2. One among the four will be evicted in Saturday's episode. The final day of the show will witness the performances of most of the participants in Bigg Boss Tamil 2. Interestingly, Tollywood's fast-growing star Vijay Deverakonda is entering the house to promote his upcoming movie NOTA. Mamathi Achari, Ananth Vaidyanathan, Nithya Balaji, Ramya NSK, Shariq Haasan, Ponnambalam, Vaishnavi, Mahat Raghavendra, Daniel Anne Pope, Aishwarya Dutta, Sendrayan, Mumtaz, Thadi Balaji, Yashika Aannand, Riythvika and Janani Iyer had entered the house on June 24 as contestants. However, Vijayalakshmi is the wild-card entrant who joined the Kamal Haasan-hosted show on the 67th day.